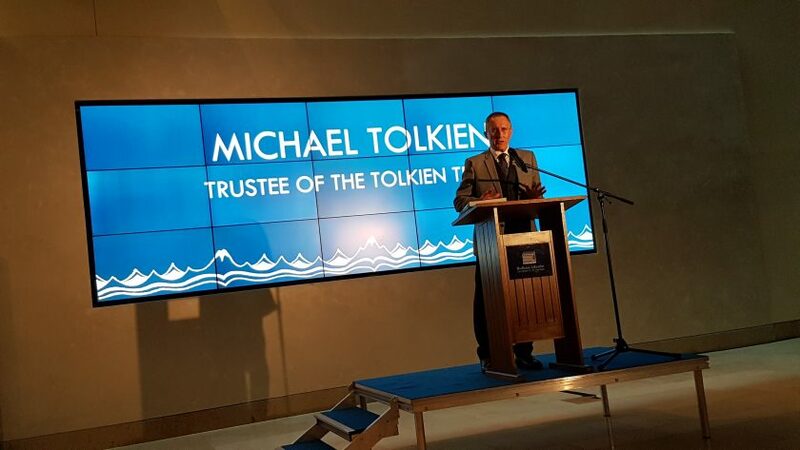 The exhibition was launched yesterday evening by Michael Tolkien at a reception attended by around 300 guests, including a substantial number of Tolkien family members and scholars—Priscilla and Baillie Tolkien, Tom Shippey, Wayne Hammond, Christina Scull, Verlyn Flieger, Dimitra Fimi, John Garth, Brian Sibley, Alan Lee, amongst many more. Curated by Catherine McIlwaine, the Tolkien Archivist at the Bodleian Libraries, the exhibition features a impressive range of manuscripts, illustrations, maps, letters and objects that belonged to Tolkien. Most of the items are from the Bodleian Libraries’s own Tolkien archive, the largest collection of original Tolkien manuscripts and drawings in the world, but the exhibition also includes items lent by the Tolkien family and Marquette University, which purchased the original manuscripts for The Lord of the Rings in 1956. Admission is free but tickets must be acquired in advance. Visit the official website to find out more. Tolkien: Maker of Middle-earth is located at the Weston Library, Oxford and runs until 28 October 2018.